Work picks up where Segment II leaves off, near Exit 242 at Humelsine Parkway. It will end near Exit 234 at Newman Road. WILLIAMSBURG, Va. (WVEC) — You can expect more traffic delays on the peninsula. 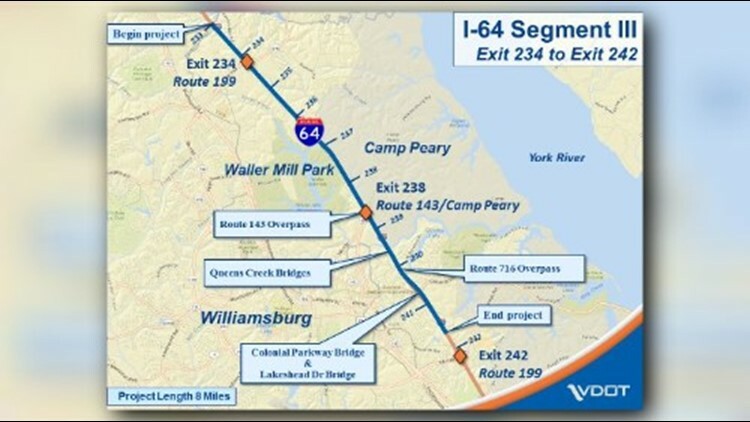 The Virginia Department of Transportation has started the next segment of the Interstate 64 widening project. Segment III widens more than eight miles of I-64 in York County. Work picks up where Segment II leaves off, near Exit 242 at Humelsine Parkway. It will end near Exit 234 at Newman Road. According to VDOT, Phase III will cost around $180 million. Crews will start by working on the westbound shoulder lane, followed by similar work on the eastbound road. They will also either repair or replace several bridges in York County. Like the previous two segments of the road widening project, VDOT is keeping two lanes open in each direction during the day. They'll temporarily close some lanes at night. Work on Segment III should finish up by fall 2021, while Segment II is expected to end next spring.